To prepare this salsa you will need tomatoes, garlic, serrano (habañero or jalapeño or a mix if you are feeling adventurous), red onion and cilantro. For a bowl of salsa the size of the photo I used: 4 vine tomatoes, 4 cloves garlic, 1.5 large serrano peppers fried in a pan little or no oil. Put the tomatoes, garlic and chiles in the pan and let them gently burn on all sides. Once blackened put in food processor or blender along with 1/4 red onion and a bunch of cilantro, blend, add salt and you can also add a squeeze of lemon or lime. You can substitute the vine tomatoes with roma or even green tomatillos. 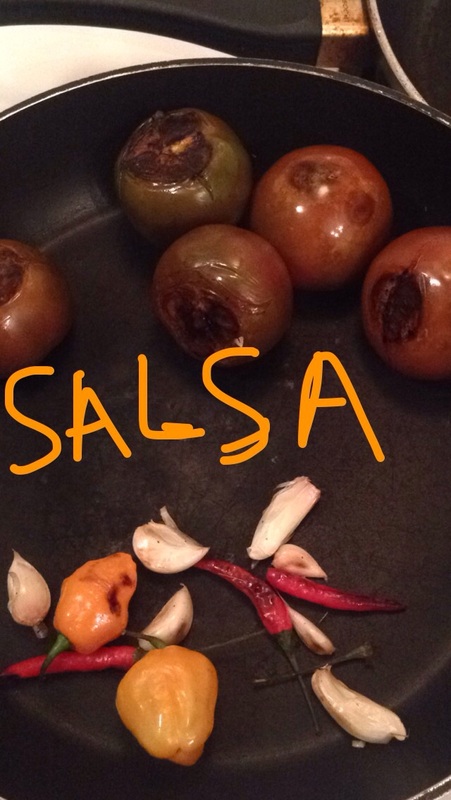 If you make green salsa be sure to add some cumin spice. Enjoy with tacos, burritos, quesadillas or chips.